To contact us or request a Federal Express Shipping Label call or click the email below. We can restore, digitize & convert your old 8mm & 16mm home movies & put them on DVD or external hard drive. We can even put your movies into a editable digital format so you can easily edit them on your own home computer. If your movies had sound we will preserve it, if not we can add instrumental background music. We can add titles, chapters, scene selection screens. We offer fast turnaround, most orders in only 5 business days. Your movies were originally developed in chemical solutions. Our services can include cleaning your old movies to remove the oxidization that comes from the residual chemical build up that develops over the years which can cause an ammonia smell & dulling layer to develop that hides the original vibrancy your old movies had when they were new. Then we digitize your movies & can enhance their color, tone, contrast, clarity to make your old movies look great like they did when they were new. We can repair damage. Most orders take 1-2 weeks. We have been restoring old movies for over 30 years & do the work for the general public as well as museums and historical societies. Our DVDs are archival quality discs each guaranteed for 100 years. We offer very reasonable prices and quick turnarounds. We can send a prepaid Federal Express label to ship your movies to us. Call Mark for a free quote. We will send you a self addressed prepaid Federal Express label, you simply place your old movies into a well packed box, put the Federal Express label on the outside, & give the box to Federal Express. Federal Express will then bring it to us. When your project is done we will ship everything back to you via Federal Express. Clients are responsible for shipping costs. We transfer and convert your family's video tapes to dvd or external hard drives. We use digital technology for optimum results, we can clean your video tapes. We use archival quality dvds for great long lasting quality. We transfer VHS, VHS-C, 8mm, Hi 8mm, Digitial Hi 8mm, Mini DV, all Beta formats,& ¾” Umatic formats. We will send you a self addressed prepaid Federal Express label, simply place your old movies into a well packed box, put our Federal Express label on it, & give the box to Federal Express. Federal Express will then bring it to us. When your project is done we will ship everything back to you via Federal Express. Clients are responsible for all shipping costs. We can repair damaged video tapes and then transfer them to dvd or a external drive for you. We will send you a prepaid Federal Express shipping label to then ship to us. Then when were done we ship your original video tapes & your new archival quality dvds or external hard drive back to you by Federal Express as well. Clients are responsible for all shipping costs. We can put your old photos, slides, diplomas, 3D objects, anything on to a DVD or VHS video. We will create a magnificent show with many types of dissolves, transitions, special effects, and background music or your own narrating. We enjoy hearing from our clients -- Call with any questions! Call us to request our Federal Express Pack. You can use it to send your items to us. Call us if you have any questions, we’re happy to help. Ask for Mark the owner. we will provide a free estimate and answer any questions they may have. All we ask is that you cover our shipping costs. We accept personal checks & money orders. We do not accept credit cards or PayPal, clients are responsible for all shipping fees. We repair torn and damaged photos. We can add color to faded photos. We have been restoring old & damaged photos for 30 yrs. We do work for the general public, many museums, historical societies. 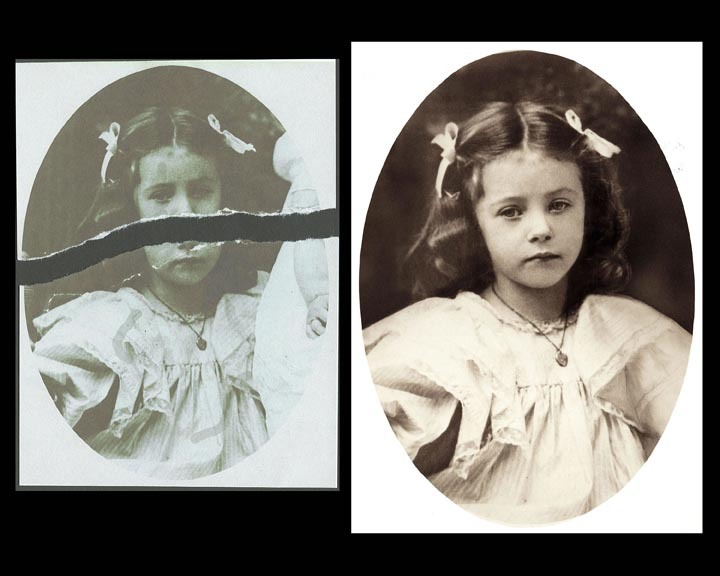 We repair severely damaged pictures, whether faded, stained, torn, missing pieces, bad color, water damaged. In addition to working on old photographs we also work on Tin Type, Glass Plate images & all sizes of negatives. We can assemble the pieces and repair the damage. We can combine two photos, repair damage and colorize. 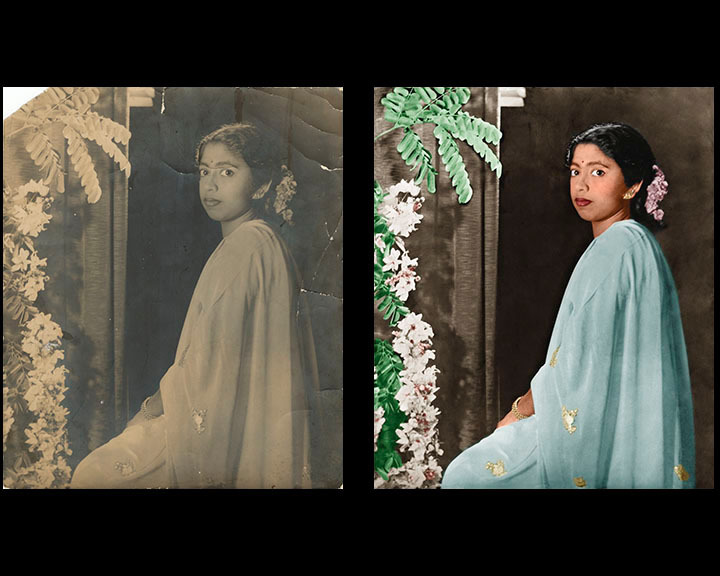 We can colorize your black and white images. to make your photograph look more like a painting. We carry a full line of textured papers to add even more elegance to your photograph. We can repair severe damage and tint or sepia photos to give them that old fashion look. We can combine two photos into one and repair the damage. 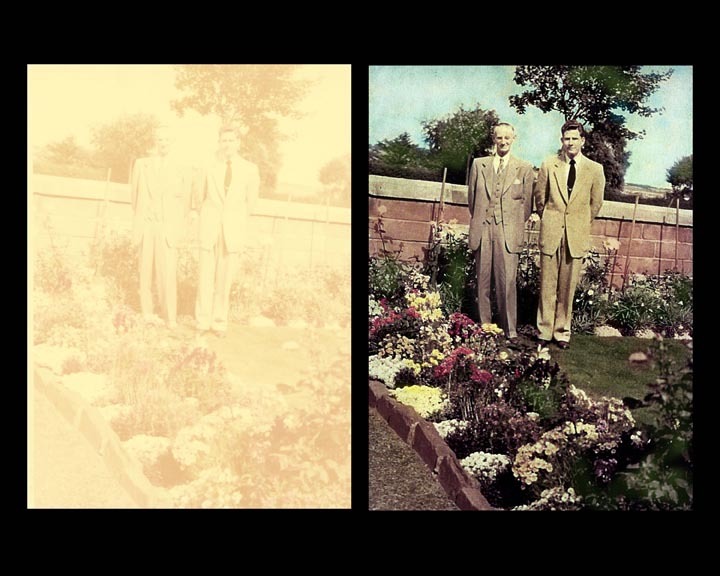 We can turn black and white photos into color and repair the damage. For clients who have us restore their photographs or other items, but cannot visit us in person, we can provide a shipping label by prepaid Federal Express shipping label to and from your home to our studios. This includes all photographs, documents, films, or videos. For clients that decide that they are not ready to restore their items or photographs with us, we will provide a free estimate and answer any questions they may have. All we ask is that you cover our shipping costs. For clients who are only sending us photos have a second option of scanning their photos & e-mailing them to us. 1. Scan your photos at a minimum of 300 dpi at 100% (of original Size). Use RGB color mode even if photo is a black & white. Turn off any photo enhancement features your scanner may have. We will respond within 24 hours, usually the same day, we can provide a written quote. Just contact us by clicking on the contact us button at the top of any page and send us an e-mail requesting us to call you or the address of where to send the Federal Express label and a general description of what type of project you have. We can provide you with an e-mail sample image (after a 50% deposit) of what your restoration will look like before we Federal Express your order back to you. We accept: PERSONAL CHECKS + MONEY ORDERS. We do not accept credit cards or PayPal. Clients are responsible for all shipping costs. We repair damaged video tapes. We repair damaged old movie film. We can enhance dark or light video tape or old movies for better quality. We will never hurt or damage any of your photos, documents, movie film, videos that you send us and you will receive all your originals back at the end of the project.